Stored fat may come from diet or de novo lipogenesis (DNL). De novo lipogenesis refers to the conversion of dietary carbohydrate (CHO) into fat. 5. Serves signal or regulatory functions (eg. antiketogenesis, tissue fat oxidation, insulin synthesis, etc). The regulation of acetyl-CoA carboxylase, fatty acyl synthetase, malonyl-CoA and other components of the enzymatic pathway is well known (1,2,3), however the quantitative importance of DNL has remained an area of uncertainty until recently (1). Net lipogenesis is quantitatively small in humans subjects following a typical diet (4,5,6,7,8). Net lipogenesis measurements using respiratory gas exchange (4,5) or from stable isotope tracer studies (4,5) indicate that under normal conditions the rates of lipogenesis from carbohydrates are small. Indirect estimates have suggested a small quantitative contribution from DNL in humans (6,9,10,11,12). Direct measurement of hepatic DNL by isolation of plasma very low density lipoprotein (VLDL)-TG, which are secreted from the liver, reveals that hepatic DNL makes a quantitatively minor contribution to secreted VLDL-TG under most dietary conditions in humans (10,11,12). Others show that hepatic lipogenesis is absent or very small in healthy subjects (7,8,12). Another study with 68% of complex carbs resulted in minimum hepatic lipogenesis (13). More studies confirmed the absence of a significant flux through hepatic lipogenesis under carbohydrate overfeeding conditions (9,14). Adipose tissue lipogenesis in both lean and obese subjects is equally small as hepatic lipogenesis (2-5g/d) under free living conditions (15). The use of long-term 2H2O administration to human subjects allows measurement of the dynamics of adipose tissue components, showing that turnover of all elements is slow, and DNL contributes ∼20% of new triglycerides in adipose tissue (16). 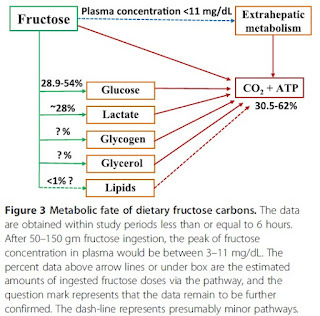 When a single high-carbohydrate meal is consumed, dietary carbohydrate merely has the effect of reducing the rate of fat oxidation, showing that the conversion of carbohydrate to fat is not an important pathway for the retention of dietary energy and for the accumulation of body fat (17). Even with massive carbohydrate overfeeding (1000kcal) for 21 days there was only a conversion of 332g of glucose to fat from a total of 5250g (250g x 21 days), or only 6% (18). In another study with a mean energy surplus of 4.1 MJ/d (~1000kcal), carbohydrate oxidation predominated, but the RQ did not exceed 1 during any 24-h period, suggesting that despite this large energy surplus, there was no net lipogenesis (19). In an overfeeding study of 14 days (20) even though de novo lipogenesis in tissues such as the liver could not be definitively determined, the calorimetry data indicated that net lipogenesis from carbohydrate did not occur. This is no different in obese subjects with either glucose of sucrose overfeeding (50%), De novo lipogenesis increases to the same extent in lean and obese women but does not contribute greatly to total fat balance (21). Special conditions lead to an increase in hepatic lipogenesis, even in eucaloric conditions, such as in a diet with 10% or less energy from fat and 75% energy from carbohydrates (8,22). This contrasts with minimum lipogenesis in a diet comprised of 40% fat and 45% carbohydrates (8). Another condition is when more than half of carbohydrates are consumed as simple sugars coupled with only 10% of fat (23). Perhaps the greatest increase recorded was in a 7 day progressive carbohydrate overfeeding study in which, after glycogen depletion by diet and exercise, 3 subjects received a diet extremely low in fat (3%) and 86% of carbohydrate (24). After glycogen stores were saturated, massive intakes of carbohydrate were disposed of by high carbohydrate-oxidation rates and substantial de novo lipid synthesis (150 g lipid/d using 475 g CHO/d) (24). But overall, the total increase rates are still small, lipogenesis is quantitatively small in humans, and the road less travelled (25). DNL is not the pathway of first resort for added dietary CHO in humans. A `functional block' therefore exists between CHO and fat in humans, analogous to the absolute biochemical block in the direction from fat to carbohydrate in all animals (1). CHO and fat must be considered separately and are probably regulated independently, by separate signals and toward separate ends (1). (4) System wouldn't work if a safety-valve (CHO to fat) were open. Regarding point 2 "CHO burnt; CHO stores fill up; less fat is burnt;", this happens in a caloric excess, so don't say or interpret this as if carbs in any circumstance cannot allow fat to be oxidized. Even in a caloric excess fat oxidation is not 100% inhibited, in fact we are burning a mix of fuels 24h (35). Often there isn´t significant differences in fat gain (I am not talking weight/water gain) in isocaloric hipercaloric diets with matched protein, regardless of macronutrient exchange (carbs vs. fat) in excess (33). In some cases it can be less for excess carbs (20). If DNL is practically irrelevant even with massive carbohydrate overfeeding, how do we gain fat with excess total calories coming from carbs?! In other words, if excess carbs are stored as glycogen, oxidized and not converted to fat in a significant way, from where comes the fat gained? Precisely from the dietary fat in the same diet! Because carbs decrease fat oxidation as they assume priority in fuel selection, coupled with the fact that fat does not stimulate it’s own oxidation (26-30) and is more efficiently digested and stored than carbs; in other words body fat still comes from dietary fat. Remember, when you ingest more carbs you decrease lipolysis and fat oxidation but at the same time you are eating less fat and storing less fat; conversely if you are eating less carbs you oxidize more fat but at the same time you are also eating and storing more fat. Back in 1960s, Hirsch et al conducted indirect estimates of the turnover rate of adipose tissue fatty acids (FA) in humans (10). At the time methods such as silicic acid chromatography with columns and thin layers and also gas-liquid chromatography (GLC) were already developed for the study of complex lipid mixtures. 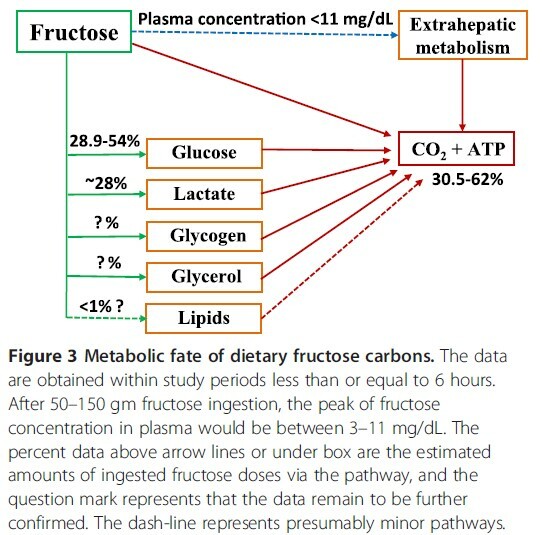 Using gas-liquid chromatography (GLC) and sample randomization, it was concluded that adipose tissue FA composition generally reflects the FA composition of diet, and that it may take up to 6 months for adipose tissue FA composition to change in response to a change in dietary FA composition, which may imply that the residence time of adipose tissue triglyceride (TG) is ∼6 months (10). The triglyceride makes up 99% of the adipose lipid. De novo lipogenesis (DNL) was estimated to make a minor contribution to stored fat. Another useful indirect method for the replacement rate of adipose tissue lipids is the rate of appearance (Ra) of plasma glycerol. Glycerol is the backbone of the triglyceride. Lipolysis refers to the breakdown of the triglyceride into fatty acids and glycerol; the triglyceride stored in adipose tissue is hydrolyzed by a hormone-sensitive lipase to produce free fatty acids and glycerol (1). Whole body lipolysis, based on Ra glycerol, is ∼1 mg·kg-1·min-1 (7,26), or ∼100 g fat/day in a nonobese 70-kg subject compared with adipose tissue mass of ∼15 kg, or about 0.6%/day of total adipose triglyceride tissue with a residence time of ∼170 days (6months) (16). Direct methods for the analysis of adipose tissue dynamics requires metabolic labeling for direct measurement. However, the labeled precursor must last for a long enough time to achieve detectable incorporation into adipose-triglyceride, due to the large pool size and slow turnover of adipose TG. Another issue is that glycerol is not utilized effectively by adipocytes (27), and glucose (one precursor for the α-glycerol phosphate in adipocytes, the other being pyruvate) is an inefficient label and not practical for long-term labeling studies. Furthermore, different FA may have different turnover rates in adipose-TG. Another method for measuring the synthesis of TG in adipose tissue is using heavy water (deuterium oxide (2H2O)) based on the incorporation of 2H from 2H2O in the glycerol moiety of TGs (28,29). This is followed by mass spectrometric analysis and application of mass isotopomer distribution analysis (MIDA) (30). This technique is very practical and easy to perform for long-term labeling studies, at least in animals, by simply drinking 2H2O-enriched water. Despite the somewhat popular belief that carbohydrates get stored as fat, specially sugars, de novo lipogenesis is quantitatively small in humans, carbohydrates only have the effect of suppressing fat oxidation post-prandially (after a meal) and clearing some fatty acids from the blood via insulin secretion, and so does protein by the way (see fuel selection). Another perspective to keep in mind is that you are not in a post-prandial state 24/7, so don’t take this out of context as many do. Would you like to know more? Subscribe for daily updates! 5. Acheson KJ, Schutz Y, Bessard T, Anantharaman K, Flatt JP, Jéquier E. Glycogen storage capacity and de novo lipogenesis during massive carbohydrate overfeeding in man. Am J Clin Nutr 1988;48:240-7. 7. Hellerstein MK, Christiansen M, Kaempfer. Measurement of de novo hepatic lipogenesis in humans using stable isotopes. i Clin Invest 1991;87:1841-52. 8. Hudgins LC, Hellerstein M, Seidman C, Neese R, Diakun J, Hirsch J. Human fatty acid synthesis is stimulated by a eucaloric low fat, high carbohydrate diet. J Clin Invest 1996; 97:2081–91. 9. Hellerstein MK, Schwarz JM, and Neese RA. Regulation of hepatic de novo lipogenesis in humans. Annu Rev Nutr 16 : 523 -557, 1996 . 10. Hirsch J. Fatty acid patterns in human adipose tissue. In: Handbook of Physiology , edited by Cahill G and Renold AE. Baltimore, MD: Waverly, 1965 , p. 181 -189. 11. Jones PJ. Tracing lipogenesis in humans using deuterated water. Can J Physiol Pharmacol 74 : 755 -760, 1996 . 13. Parks EJ, Krauss RM, Christiansen MP, Neese RA, Hellerstein MK. Effects of a low-fat, high-carbohydrate diet on VLDL-triacylglycerol assembly, production, and clearance. J Clin Invest 1999;104:1087–96. 14. Hellerstein MK. 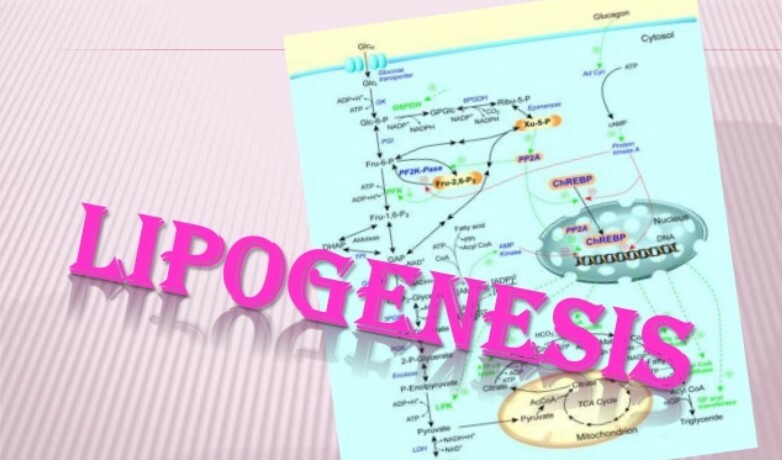 De novo lipogenesis in humans: metabolic and regulatory aspects. Eur J Clin Nutr 1999;53:S53–65. 15. Guo ZK, Cella LK, Baum C, Ravussin E, Schoeller DA. De novo lipogenesis in adipose tissue of lean and obese women: application of deuterated water and isotope ratio mass spectrometry. Int J Obes 2000; 24:932–7. 17. Acheson KJ, Flatt JP, Jéquier E. Glycogen synthesis versus lipogenesis after a 500 gram carbohydrate meal in man. Metabolism. 1982 Dec;31(12):1234-40. 18. Lammert O. Grunnet N, Faber P. Effects of isoenergetic overfeeding of either carbohydrate or fat in young men. Br J Nutr. 2000 Aug;84(2):233-45. 20. 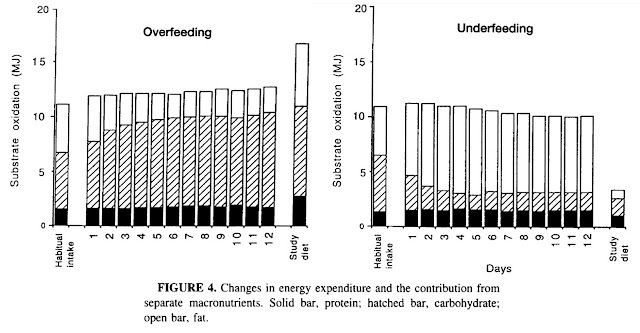 Tracy J Horton, Holly Drougas, Amy Brachey, George W Reed, John C Peters, and James Hill .Fat and carbohydrate overfeeding in humans: different effects on energy storage. Am J Clin Nutr 1995;62:19-29. 21. McDevitt RM, Bott SJ, Harding M, Coward WA, Bluck LJ, Prentice AM. De novo lipogenesis during controlled overfeeding with sucrose or glucose in lean and obese women. Am J Clin Nutr 2001;74:737–46. 22. Hudgins LC, Hellerstein MK, Seidman CE, Neese RA, Tremaroli JD, Hirsch J. Relationship between carbohydrate-induced hypertriglyceridemia and fatty acid synthesis in lean and obese subjects. J Lipid Res 2000;41:595–604. 25. Marc K Hellerstein. No common energy currency: de novo lipogenesis as the road less traveled. Am J Clin Nutr 2001;74:707–8. 28. Turner SM, Murphy EJ, Neese RA, Antelo F, Thomas T, Agarwal A, Go C, and Hellerstein MK. Measurement of TG synthesis and turnover in vivo by 2H2O incorporation into the glycerol moiety and application of MIDA. Am J Physiol Endocrinol Metab 285 : E790 -E803, 2003 . 29. Turner S, Samady W, Castuciano A, Murphy E, and Hellerstein MK. Independent effects of leptin and caloric intake on adipose metabolism in the ob/ob mouse (Abstract). FASEB J 16 : A987 , 2002 . 30. Hellerstein MK, Neese RA. Mass isotopomer distribution analysis: a technique for measuring biosynthesis and turnover of polymers. Am J Physiol. 1992 Nov;263(5 Pt 1):E988-1001. 34. Prentice AM. Alcohol and obesity. Int J Obes 1995; 19(suppl):S44–50. 35. Audrey Bergouignan, Elizabeth H. Kealey, Stacy L. Schmidt, Matthew R. Jackman, and Daniel H. Bessesen. Twenty-Four Hour Total and Dietary Fat Oxidation in Lean, Obese and Reduced-Obese Adults with and without a Bout of Exercise. PLoS One. 2014; 9(4): e94181. 36. Shetty PS, Prentice AM, Goldberg GR, et al. Alterations in fuel selection and voluntary food intake in response to isoenergetic manipulation of glycogen stores in humans. Am i Clin Nutr l994;60:534-43. 37. McNeill 0, Morrison DC, Davidson L, Smith iS. The effect of changes in dietary carbohydrate v fat intake on 24 h energy expenditure and nutrient oxidation in post-menopausal women. Proc Nutr Soc l992;5 1 :91A(abstr). 39. Flatt JP, Ravussin E, Acheson Ki, Jequier E. Effects of dietary fat on postprandial substrate oxidation and on carbohydrate and fat balances. I Clin Invest 1985;76:l019-24. 40. Griffiths AJ, Frayn KN, Humphreys SM, Clark ML. Modification of postprandial substrate balance by the addition of fat. Proc Nutr Soc 1993;52:236A (abstr). Donations to support my work here are gratefully accepted. © Copyright 2016 — Big Fitness Project. All Rights Reserved. Powered by Blogger.